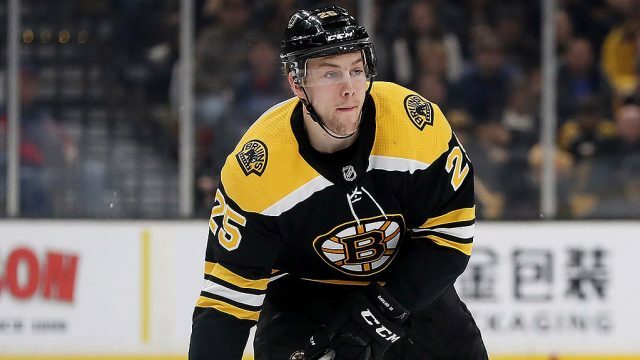 Boston Bruins defenseman Brandon Carlo just completed his third season in the National Hockey League. The Colorado native missed the past two postseason runs due to timely injuries. During the 2016-2017 season finale against the Washington Capitals, Carlo suffered a concussion after being hit by Alex Ovechkin. Last season, the blue-liner sustained a fractured left ankle during game No. 77 while falling along the boards against the Florida Panthers. This postseason will be different, as the 22-year-old will be dressing for his first NHL playoff game Thursday night for Game 1 against the Toronto Maple Leafs. This season, head coach Bruce Cassidy has relied heavily on Carlo. Cassidy hopes that Carlo will continue to defend well and skate reliable minutes during the postseason. While excited to finally get a taste of playoff hockey, Carlo looks to continue to play consistently and not overwhelm himself.